The Beaverhead River is an approximately 69-mile-long (111 km) tributary of the Jefferson River in southwest Montana (east of the Continental Divide). It drains an area of roughly 4,778 square miles (12,370 km2). The river's original headwaters, formed by the confluence of the Red Rock River and Horse Prairie Creek, are now flooded under Clark Canyon Reservoir, which also floods the first 6 miles (9.7 km) of the river. The Beaverhead then flows through a broad valley northward to join the Big Hole River and form the Jefferson River. With the Red Rock River included in its length, the river stretches another 70 miles (110 km), for a total length of 139 miles (224 km), one of the more significant drainages of south-western Montana. 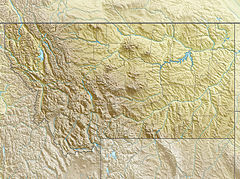 The name of the Beaverhead originates from Beaverhead Rock on the middle river. This rock formation was recognized by Sacajawea when the Lewis and Clark Expedition passed the area in 1805. There were also many beavers in the area at the time, but the name does not originate from the animal. In 1805, Captain Meriwether Lewis traveled up the Jefferson and Beaverhead first, but when the rest of the expedition came, a sign Lewis had left at the confluence of the Beaverhead and Big Hole telling them to follow the Beaverhead had been cut down by a beaver, and the expedition traveled up the Big Hole instead. As a result, the swifter current of the Big Hole swamped two of their canoes before they could travel back down to the confluence. Together with the Red Rock River, the Beaverhead forms the uppermost headwaters of the Missouri River, the longest tributary of the Mississippi River. The river is a Class I water from the Clark Canyon Dam to its confluence with the Jefferson river for the purposes of public access for recreational purposes. Beaverhead Watershed Committee - The Beaverhead Watershed Committee is a subcommittee of the Beaverhead Conservation District which operates out of Dillon, Montana. It was formed in August 2001 by a diverse group of landowners and stakeholders with the common goal of improving and repairing the environment across the watershed. It engages in projects related to water quality, water quantity, grazing/fencing, weed management and outreach. Jefferson River Watershed Council — The mission of the Jefferson River Watershed Council is to coordinate efforts, through a spirit of community cooperation and sharing, that will enhance, conserve, and protect the natural resources, quality of life, and economic vitality of the Jefferson River watershed. Trout Unlimited — Trout Unlimited's mission is to conserve, protect and restore North America's coldwater fisheries and their watersheds. Western Watersheds Project — The mission of Western Watersheds Project is to protect and restore western watersheds and wildlife through education, public policy initiatives and litigation. Montana River Action — The clean flowing waters of Montana belong to the people and are held in trust by the State for a pollution-free healthful environment guaranteed by our Montana Constitution. Montana River Action's mission is to protect and restore rivers, streams and other water bodies. Wikimedia Commons has media related to Beaverhead River. ^ "Beaverhead River". Geographic Names Information System. United States Geological Survey. ^ "Beaverhead River". Montana Fishing Guide. Archived from the original on 8 November 2009. Retrieved 2009-11-10. ^ "Beaverhead River and Big Hole River". Montana Fish, Wildlife and Park Service. Archived from the original on 8 November 2009. Retrieved 2009-11-10. ^ Huser, Verne (2004). On the river with Lewis and Clark. Texas A&M University Press. p. 89. ISBN 1-58544-344-1. ^ "Beaverhead Watershed Committee". Retrieved 2015-09-22. This page was last edited on 14 November 2018, at 03:30 (UTC).